Just as we can feel whether we are lying on a soft blanket or hard rocks, our cells sense whether they are in a soft or rigid mechanical environment. However, the molecular mechanisms underlying cells' ability to detect tissue stiffness are largely unknown. Mechanical forces acting across individual molecules in cells are extremely small and cannot be measured by conventional methods. Scientists of the Max Planck Institute of Biochemistry in Martinsried have now developed a new technique to quantify forces of only a few piconewton in cells. As a result, the researchers were able to identify the central mechanism that allows cells to sense the rigidity of their environment. To measure the exerted molecular forces, Carsten Grashoff and his team have engineered two novel fluorescent biosensors that change their color in response to piconewton forces. Genetic insertion of these biosensors into the protein of interest allows the microscopic evaluation of molecular tension in living cells. About five years ago, Grashoff presented the first tension sensor prototype, which has been used in many laboratories worldwide, but he is confident that the new technique will be applied by many research teams as well. "The new probes enable us to resolve differences in mechanical tension with much higher precision," said study leader Grashoff. By applying the method to the cell adhesion protein talin, the researchers at the Max Planck Institute discovered the central mechanism that allows cells to feel their mechanical environment. 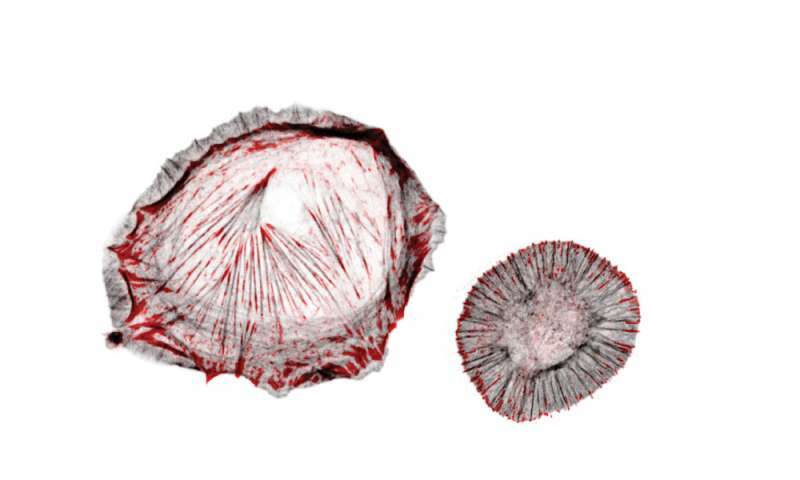 "Talin carries mechanical force of about seven to ten piconewton during cell adhesion," Grashoff explained. "We expected that talin is involved in the force sensing process but we had no idea how important it really is. Cells in which talin is not able to form mechanical linkages can no longer distinguish whether they are on a rigid or a soft surface." The researchers also found that a second talin protein, called talin-2, can be used by cells to adapt to very soft environments. Since talins are present in all cells of our body, the researchers believe that they have found a general mechanism cells use to measure the extracellular rigidity.